My work examines the history of health and corporeality in the early modern world with a particular focus on Latin America, the Caribbean, the African diaspora and, more generally, the Iberian and Black Atlantic Worlds. My book, The Experiential Caribbean: Creating Knowledge and Healing in the Early Modern Atlantic (winner of the Albert J. Raboteau Book Prize and Honorable Mention-Bolton-Johnson Book Prize for best book in Latin American History), explores belief making and the creation of evidence around the human body and the natural world in the early modern Caribbean. I am currently working on a history of the quantifiable body and the development of novel ideas about risk, labor, and disease that appeared in Atlantic slave markets during the seventeenth century. I am also actively involved in projects of digital archival preservation in Colombia, Cuba and Brazil. 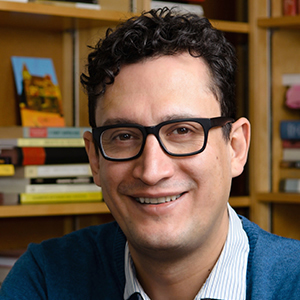 Pablo F. Gómez. 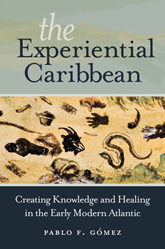 The Experiential Caribbean: Creating Knowledge and Healing in the Early Modern Atlantic. University of North Carolina Press, 2017. Winner of the 2018 Albert J. Raboteau Book Prize. Honorable mention Bolton-Johnson Book Prize for best book in Latin American History (2018)..
“Caribbean Stones and the Creation of Early Modern Worlds,” History and Technology 34 (2018). “Afro-Caribbean Healers,” in ed. William Beezley, The Oxford Research Encyclopedia of Latin American History (New York: Oxford University Press, 2016). Jane Landers, Pablo Gómez, José Polo Acuña and Courtney J. Campbell, “Researching the history of slavery in Colombia and Brazil through ecclesiastical and notarial archives,” in ed. Maja Kominko, From Dust to Digital: Ten Years of the Endangered Archives Programme, (Cambridge: Open Book Publishers, 2015), 259-92. “Incommensurable Epistemologies? The Atlantic Geography of Healing in the Early Modern Black Spanish Caribbean,” in Small Axe: A Caribbean Journal of Criticism (2014) 44: 95-107. Duke University Press. “Transatlantic Meanings: African Rituals and Material Culture from the Early-Modern Spanish Caribbean,” in Materialities of Rituals in the Black Atlantic, eds. Akinwumi Ogundiran and Paula Saunders, (Bloomington: Indiana University Press, 2014). “The Circulation of Bodily Knowledge in the Seventeenth Century Black Spanish Caribbean,” in Social History of Medicine, (2013) 26 (3): 383-402. * Winner of the 2014 Biannual Best Article Prize by the Association of Caribbean Historians, and the Vanderwood Prize-Honorable mention for Best Article, The Conference in Latin American History (CLAH), 2014-2015. MEDHIST 275: Science, Medicine and Race: A History. MEDHIST 919: Health, Healing and Science in Africa and the African Diaspora. MEDHIST 507: Health and Healing I: History of Healing from Antiquity to 1750. MEDHIST 564: Disease, Medicine and Public Health in the History of Latin America and the Caribbean.